The hair trends are something that changes every few years. As a person who always likes to stay one step ahead of his peers when it comes to all things style, you would love to keep yourself updated on all the latest happenings in the world of hair makeovers and styling. The latest in-thing in the world of haircuts is the fade haircuts. In this style, the hair at the center is kept long or of medium length. The hair at both the sides and at the back of the head is kept in such a way that it looks like the length of the hair has seamlessly transitioned from long to short and shorter. The best part about this look is that you can mix up several other looks with this one to make it look even better. Try mixing pompadour or sleeked back hair with this one and you will fall even more in love with Fade Hairstyles for Men. Make sure that you visit a good stylist to get the cut done on you. It must get done right to achieve the cool and edgy look that you want for yourself. Step out in confidence with this haircut. This fade haircut is really easy to achieve and great to carry off. The good thing about this fade haircut is that you can carry it off even if you are not too experimental with your hairstyles. Keep both sides of your hair fading and the center portion of the medium length. Make sure that the parting to your hair is done having the right amount of definition. You have the perfect edgy hairstyle on your hand. There is no reason to think that fade hairstyles only work on straight hair. They look equally stylish with curly hair. There is no need to create a parting for this one. Just do the fade haircut on both of the sides of your hair. The center part must be kept of medium length to bring out the style in a better manner. You can always ask your stylist to make curls on your hair if you do not have naturally curly hair. Make the faded haircut on both sides and the back of your hair. The rest of your hair needs to be kept at a long length to make the really popular pompadour hairstyle. In the pompadour haircut, the hair is rolled back to complete the look. This is one of the coolest hairstyles that you can try. The best part is that it looks great on any kind of face shapes. If you are not daring to go too far into the faded haircut trend, then this style is the one for you to try. This one is for the beginners in the world of haircut experimentation. The faded part is blended well with the rest of hair, and it is not kept too starkly noticeable. The hair in the middle of the head is kept at medium length. Spike up the hair in front to complete this wow look. If you are going to go all out daring with the haircut, then this is your ideal match. This one will make sure that all heads turn towards you in admiration of your sense of style. There are two clear partings made on each side of the head for this cut. The hair in the exact center of your head is kept in a pompadour style to complete the look. It looks great on dark hair. Fade haircut also looks great with the very common and popular hairstyle of slicking the hair back. Keep the hair at the center long enough to make sure that it looks stylish when you try the slick back look with ample hair gels. Both the sides and the back of the hair must sport the very trendy faded haircut. This look brings edgy and cool in one seamless combination. The fade hairstyle will also work if you are someone who is not too fond of keeping long hair. You can add the extra oomph to this look by having the rightly trimmed beard to go with it. Sweep the hair in the center of your head frontward to complete this fashionable look. It looks amazing with tee shirts and casual shirts. Try this one for your next party to make sure all eyes are on you. This is one hairstyle that looks cool without trying too hard. If you are planning to rock your look for the next party, you must give this look a try. Just sweep off the long hair at the center of your head frontwards and leave the rest of the haircut to fade naturally into buzz cuts. Accessorize it right, and it can be the ideal look to try out to garner compliments from all quarters. The thing about this hairstyle is that the fading haircut is done so intensely that at the ends of all the sides, your skin starts showing. This look is not as difficult to achieve as it looks. All you need is ample amounts of hairstyling products like hair gels and a really fine-toothed comb. Comb over all the hair to the right of the parting after keeping the parting to the left side of your hair. If you are tired of playing it safe with your hairstyle, then now is the time to go all out with experiments. 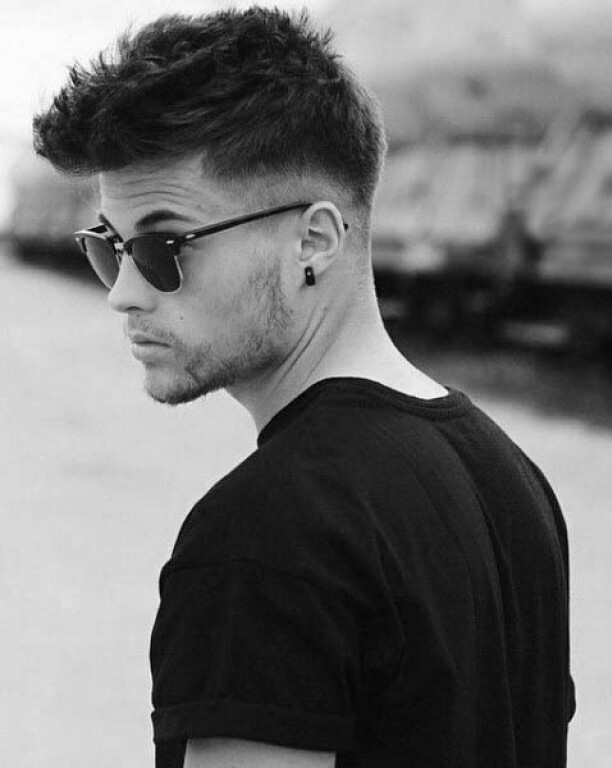 The fade haircut is the best way to start the daring experiments and it becomes even better when you add the always popular Mohawk style to it. Make sure that the parting on the both side is well defined enough to make both the fade haircut and the Mohawk stand out prominently. Just stepping foot in the world of hair makeovers? This style has tailor-made for you as a beginner. Here the fading is kept at a minimum and the long hair at the center of your head keeps the fading from being too visible and stark. You can sweep your hair back and brush it well to get the look. It is great if you can add some volume to the hair in the center by making it puff up. That will bring more definition to this look and make it look even better than ever on you. When you mix up two of the coolest hair trends of fading and pompadour in one style, the results are nothing short of superb. This hairstyle is the biggest proof of the fact. Make sure you have a fancy beard to go with it for it to look really powerful and masculine. The main requirement for doing the pompadour right is making sure that your hair in the center is long enough. There are no partings with this one so that makes this hairstyle even more easy to achieve compared to the others. Men with extremely short hair need not fret that they cannot get the fade hairstyle done on themselves. They can do it too and rock it just as well as men with long hair. The fading looks seamless and even better with this one as the hairstyle. If you are someone who always wanted to have a low maintenance but super stylish haircut, then this one would be the perfect choice for you. All you need in the morning or before going out to a party is a hairbrush to comb the hair well and sweep it frontwards. The really interesting thing about this hairstyle is how it looks like it is tapering from the front to the back of your head. This is one of the favorite styles of men across the world. If you have a thick mass of hair, then this is the style to try out for you. The hair looks like a gradient falling from the top of your head to both the sides and the back of your head. The best part is that you do not need to have a particular facial shape to rock this look. Not really fond of the typical Mohawk? Try the latest entry in the market of hair makeovers called the Faux hawk. The hair in the Centre is swept upwards like a Mohawk but it is not kept as defined as a Mohawk is. In fact, the hair is messed up to create a casual and bohemian vibe to the look. Try this one with your jackets and overcoats and you are guaranteed to fall in love with this one.